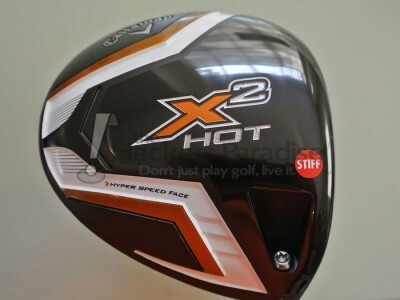 As a follow up to the successful X-Hot line of clubs, THP has a preview of the 2014 follow up line called the X2 Hot. The “sequel” includes a full line of products each with both standard and pro versions. The line was developed to be longer, faster and more forgiving to a broader range of golfers. 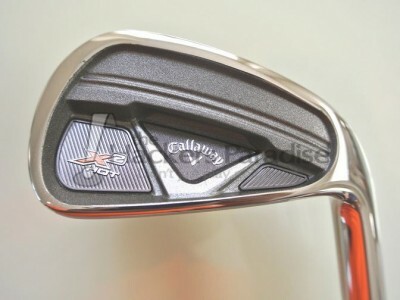 The THP Forum has full in hand pictures of this entire new lineup of clubs. Emphasizing the focus on distance, the X2 Hot Drivers debut the Company’s Hyper Speed Face technology, with a large overall design based on player impact probability and stress distribution across the face, resulting in high average balls speeds and a lighter weight construction. Players can independently adjust the driver’s loft and lie with the Company’s Advanced Optifit Hosel. Loft can either be decreased by 1-degree or increased by up to 2-degrees to help optimize the launch angle and backspin. The lie angle can also be adjusted between Neutral and Draw, which will influence the directional bias. Eight total settings are available to help golfers adjust their trajectory and shot shape and unearth maximum distance gains for their game. There are many recipes for distance — no singular clubhead shape, size, loft, CG position, head weight, club length or swingweight optimizes performance for everyone. So Callaway is bringing options in the X2 Hot line to promote optimal distance gains for all swings. The standard version of the X2 Hot Driver is 460cc, available in 9°, 10.5° and 13.5°HT lofts, and comes stock with an Aldila Tour Blue shaft. The Pro version, available in an 8.5° offering, is 440cc, features a lower, more neutral center of gravity, and includes a 7 gram external weight. The Pro model will be available with the Aldila Tour Green shaft as the stock offering. The new product introduction retail price for both models is $349.99. The Company’s fairway wood market share doubled in 2013. To keep pace in 2014 with X2 Hot, the team added the new Hyper Speed Face Cup technology that incorporates a thinner face for added ball speed, particularly on impacts low in the face. The addition of a 455 carpenter steel face cup changed the paradigm in last year’s wildly popular fairway wood, yet initial testing has shown the new Hyper Speed Face Cup is adding 1.4 mph average ball speed over its predecessor. The team also improved the Internal Standing Wave, a weighting system that gives Callaway engineers an ideal CG position for distance from all impact locations on the face, and allows them to position weight close to the face without reducing its flexibility. Callaway will offer a host of options in the X2 Hot Fairway Wood, expanding the distance and versatility offerings for various player types and playing conditions. This includes new options of the Deep Fairway Woods, which gained notoriety with Phil Mickelson’s incredible birdie on the Par 5 17 en route to his 2013 Open Championship victory. Options include a 3-, 4-, 5-, 7-, 9- and 11-wood in the Standard model; a 13.5°, 15°, 17° and 19° in the Pro model, and Callaway will add to its Deep series with an X2 Hot Pro 2Deep, a 3Deep and a 5Deep offering. Stocks shafts are the same as the driver. The new product introduction retail price is $229.99. The X2 Hot Hybrids represent a huge leap in technology, performance and contemporary looks from its predecessor. Taking cues from the success of Callaway’s explosive fairway woods and the staggering distance they introduced in 2013, the X2 Hot Hybrids add the Hyper Speed Face Cup and an Internal Standing Wave in a hybrid for the first time. These technologies and others have resulted in a sweet spot that is 13 times larger than its predecessor’s (not a misprint), CT that is up to 22% higher on center hits and up to 30-40% higher on off-center hits. A new, more contemporary head shape, largely based on Tour feedback, complements the performance and distance technology. The X2 Hot Hybrids feature a larger face area, a straighter, flatter leading edge and less offset. Callaway will offer a 3-, 4-, 5- and 6-Hybrid in the Standard model and a 16°, 18°, 20° and 23° Hybrid in the Pro model. Same stock shafts as the other woods products. And the new product introduction retail price is $199.99. The Standard X2 Hot Iron, ironically, sets a new standard in distance irons. These clubs have a new Deep Central Undercut that increases the face compliance to boost ball speeds and – you guessed it – distance. A stabilizing arch optimizes the stiffness distribution across the face for a great sound and feel, while moving the hot spot lower on the face (and therefore more in line with a player’s impact location). Distance and ball speed are a huge part of the X2 Hot Iron story, but why stop there? High MOI along with a repositioned center of gravity and improved turf interaction have helped improve the downrange consistency by as much as 40%, easily making these the most accurate long distance irons Callaway has ever designed. The Pro model, with a thinner face and a uniquely designed stabilizing arch that moves the weight low and central – retains high ball speeds and distance advantages, but without an undercut cavity and in a compact shape that is more appealing to discerning players. The X2 Hot Pro Iron is further differentiated through a greater progression in offset and CG height, which helps retain some forgiveness in the longer irons while making the short irons more controllable and more appealing to the eyes for better players. In the Standard model, the stock steel shaft is a True Temper Speed Step 85; the new product introduction retail price for a steel set is $799.99. The stock graphite shaft is a lighter-weight offering than has been offered before, and the new product introduction retail price is $899.99. In the Pro model, the standard steel shaft is the Project X 95 Flighted shaft and the new product introduction retail price is $899.99. Don’t forget to check out the THP forum for more in hand pictures of the entire line. looking stuff here, but I’m not sure it is enough to kick my X Hot clubs out of the bag, and I like the looks of the regular irons better. I am excited about this new line, the old set the bar and it looks like the new will raise it. Everything I read about the woods excites me. A newer longer 3deep, not sure that’s possible but it will be tested to see if a switch will be made. The same holds true for the hybrid. A long 18* will change the makeup of my bag. Well done Callaway with this release. Seems like a great deal of thought went into it. I see some very exciting clubs in this preview. Callaway sounds like they are going to have a big winner on their hands with these offering. The advancement with the hybrid has really got my attention. Callaway is really bringing it these last few years. Exciting stuff here. Looks like Callaway made some great improvements in this line! Very interested in this. Picked up the Xhot Pro driver and am very impressed with it after 2 rounds.